Added coil material to the new atomizer screen so you see your profile and coil material now. Added the availability to have advanced preheat settings with the Preheat+ toggle when temp control is active on the Profile Menu. You can now toggle on Preheat+ to have the ability to adjust preheat watts and preheat temp. The ohm emblem on the Profile Menu now takes you to the Coil Info screen to adjust, remeasure, and or lock ohms. Lots of readjusting and realigning to get the theme as clean and visually appealing as possible but keeping the overall simple default look. Added all old Status screen readings to Puff Info screen per request for the Status screen info. Enlarged serial number box some to accommodate other devices to read clearer. Fixed Coil Info screen to go back to parent screen instead of Main screen on exit. 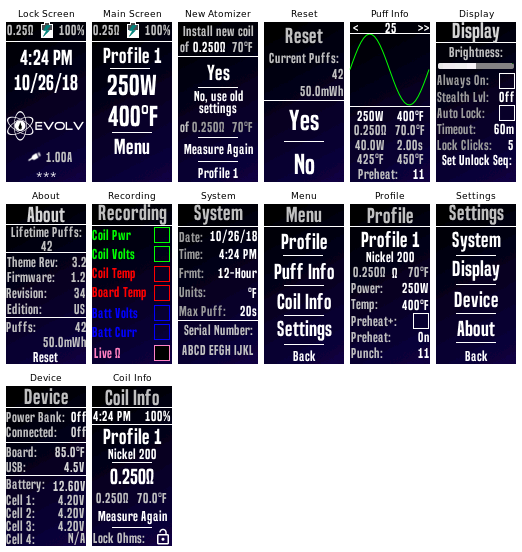 When on main screen and not in active Replay saved puff, you can select ohm reading to shortcut you to coil info screen to remeasure and or fine tune coil ohm reading per a user request for more exotic coils. Left arrow takes you back one step at a time, right arrow takes you to newest puff. Overall visual improvements and better refinement with removal of redundancies across screens. Back buttons added back to Menu and Settings with round robin scrolling as it just seems more functional. Added coil material to Profile and Status Screen for those who want custom profile names. 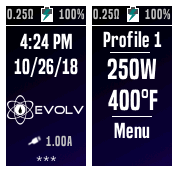 Profile screen now has a lock ohms option if needed. Removed ohms measurement on Status screen as it can be done on Profile screen. Device screen is a complete makeover now with power bank settings as well as individual battery voltages for up to 4 batteries. About screen changed lifetime energy to lifetime puffs. Reset now takes you to separate reset screen to prevent accidental resets. Reset screen added with current puff info, yes or no to reset, and reset counts. Added punch / preheat in place of the status bar on the Puff Info and Status screen to better help dial in the perfect puff. Added USB / Computer connection logos to the lock screen along with current charging amps when connected to either one. Spaced time and date fields on the lock screen for a little better visual effect. Fixed a couple of temp readings to read only. Fixed a few bugs and misaligned fields. Let me know of any problems encountered please. Nice theme! Always liked the default theme just wanted all the hidden options in the theme rather than loading escribe and editing those settings. Good to see this keeps everything transparent! Thank you so much for the review and I am glad you like the theme. I also really like the default theme and just wanted the added options without having to have my computer. I wanted to try to keep it simple and straight forward just like the default theme and hopefully the added status bars help with explanation of everything else. Thank you for your kind review and let me know of any problems encountered or any additions you would like to see. Great Job in bringing all important options of Escribe (for my usage) on to the mod screen without altering the simplicity of the orginal Evolv-theme design. This is exactly what I was looking for, not fancy with graphics, eventually using up too many resources of the 250C, but simple in look, intuitive in use and comprehensive in function. For my purposes I changed the increments of Watts back to 0.1 W, since my usage ist around 20 Watts, and small changes can count. But that modification is a game, compared to all the great Expansions you brought to the original Evolv-Theme. Just the theme I wanted. Clean as the original with added features. The 1W increment is a big plus. Thank you for your review and I am so glad you like the theme. I will continue to try to make it better and better for everyone. Love the simplicity of this theme. Some of the others just seem a bit too busy. Great stuff. Thank you for the review. I love the simplicity but still having the available extra options of this theme. I do agree some of the other themes seem just too busy. I try to keep it very simple but functional in the back ground with all available options. Thank you for your request as I'm always open for requests as well to make it the best theme possible.